Europe’s cultural heritage ‘Oscar’, the Europa Nostra award acknowledges best practice in heritage conservation, management and research: one of the recipients this year is the eighteenth-century mansion at Oud Amelisweerd on the outskirts of the Dutch city of Utrecht. 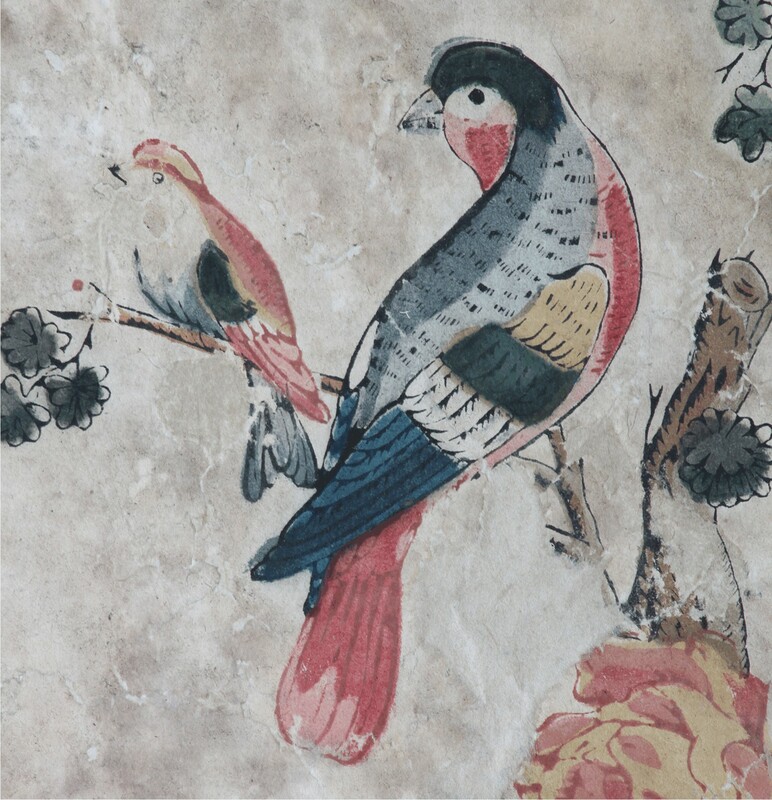 Two of the ground floor rooms at Oud Amelisweerd are decorated with Chinese wallpapers – one from the late eighteenth century with a pattern of birds and flowers, the other, installed in the early nineteenth century, with hunting scenes and depictions of a dragon boat race. 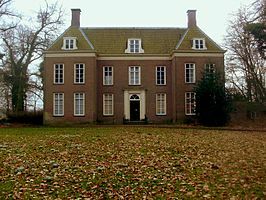 Both sets were conserved in 2011 by the Leiden-based partnership XLpapier, and now form the main historic decorative element in the otherwise unfurnished house. The history and conservation of both sets were the subject of a presentation by conservator Thomas Brain at the recent London conference ‘Chinese wallpapers: trade, technique and taste’, which was held at Coutts Bank and the Victoria and Albert Museum, and which brought together much recent research from Chinese and European perspectives into the origins and use of these most beautiful and fascinating of wallpapers. 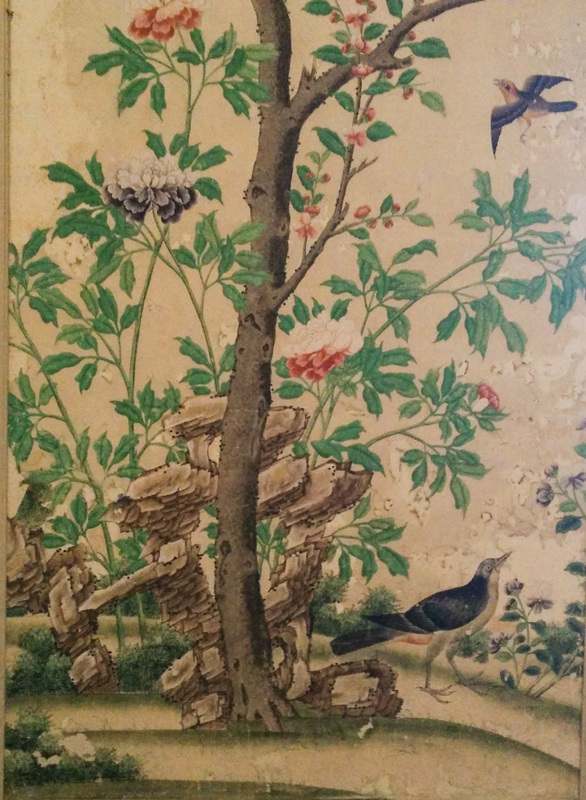 The two Chinese wallpaper schemes at Oud Amelisweerd can be viewed in their original locations, but many fragments of European printed wallpapers from different periods of occupation have also been found in the house and have been put on display in a particularly imaginative way in the spacious study area cleverly fitted into the attic storey, and reached up a steep flight of wooden steps. The visitor is confronted with what appears to be a cube-shaped stack of ancient sheets of paper about the size of a large desk. 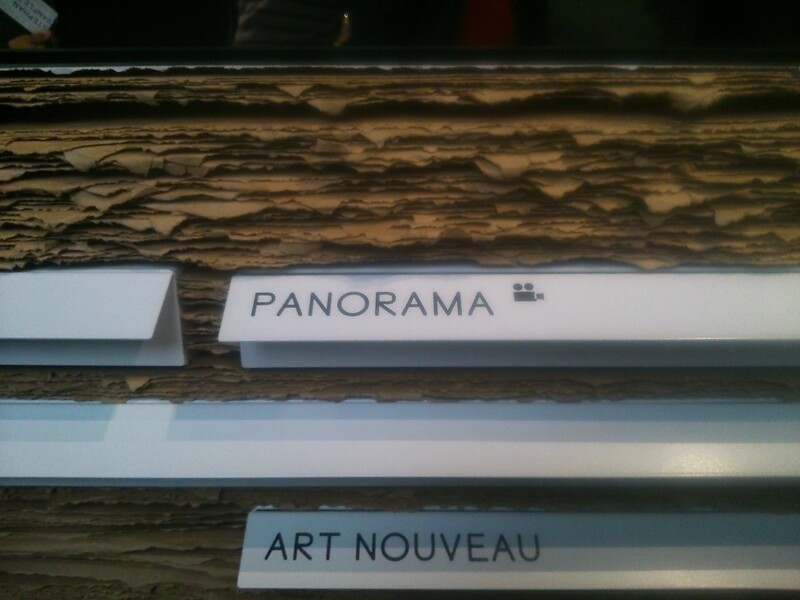 Labels set into the deckle-edged sides of the cube turn out to be the handles of drawers which, when pulled out, display a section of early wallpaper along with information about its origins, date, technique and use in the house. 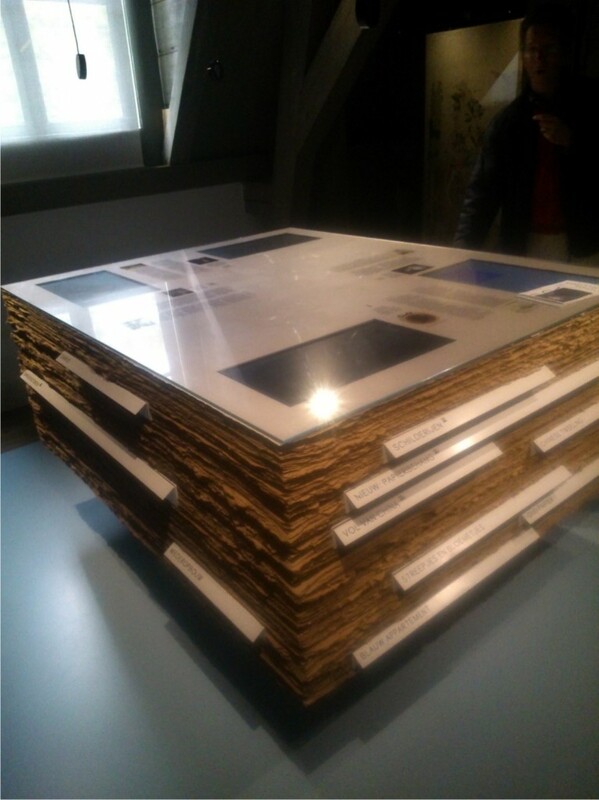 The glass top of the cube incorporates a number of touch-screen panels which explain (among other things) the role of the Dutch East India Company (VOC) in bringing Chinese papers to Europe, enlivened by ingenious animations of contemporary paintings and prints. Equally imaginative is the way in which the first floor rooms have been sensitively adapted as exhibition space for contemporary art. 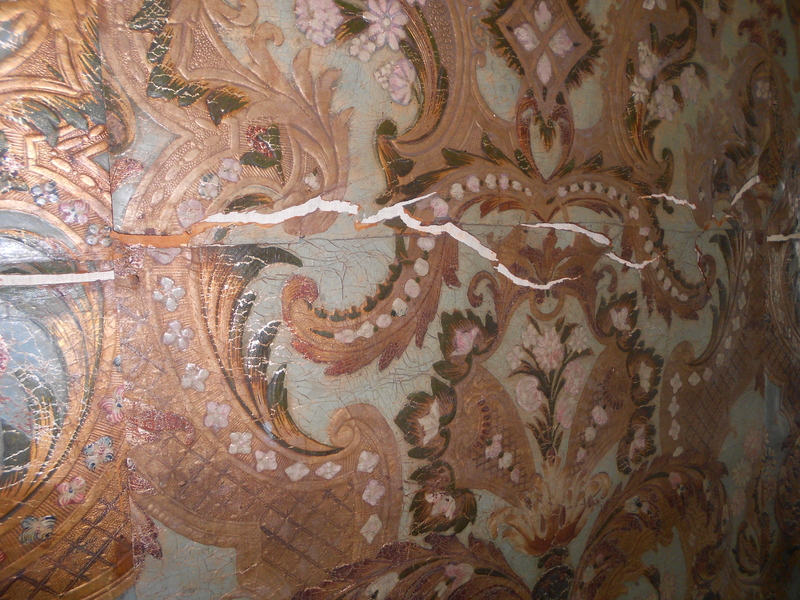 Rather than undergo any form of restoration, the walls have apparently been left in that particular state which follows careful forensic investigation but precedes the recreation of the décor of one selected period. ‘Apparently’ – because the historic wall surfaces are only dimly visible through a gauze-like layer of white textile, stretched like an eighteenth-century damask but creating the kind of minimalist white space required for the display of modern art. Admittedly this approach makes a virtue of a necessity, inasmuch as no original furniture or paintings remain in the house, yet it succeeds admirably in realising two potentially antagonistic objectives – conservation and reinvention – within one space at one time. 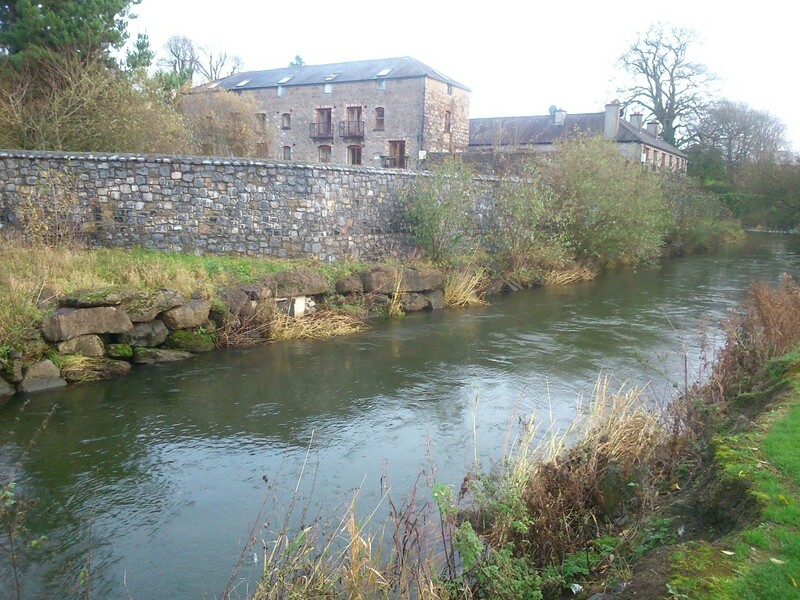 Conservation projects in Ireland have also won the prestigious Europa Nostra award, but in at least one case the building highlighted for merit has fared badly since the fanfares have died down. The early eighteenth-century mansion of Rathfarnham House (later known as Loreto Abbey) – not unlike Oud Amelisweerd in its scale and location on the edge of the city – underwent major conservation and refurbishment in 1982-4, when it was still a boarding school in the ownership of the Loreto Order, for which it won a Europa Nostra diploma. Rathfarnham House was built in 1725 by Edward Lovett Pearce for William Palliser, son of the archbishop of Cashel of the same name. One wall of the saloon is hung with gilt leather made in the Spanish Netherlands and dating from the 1720s – an extremely rare example of this costly material remaining in its original location. 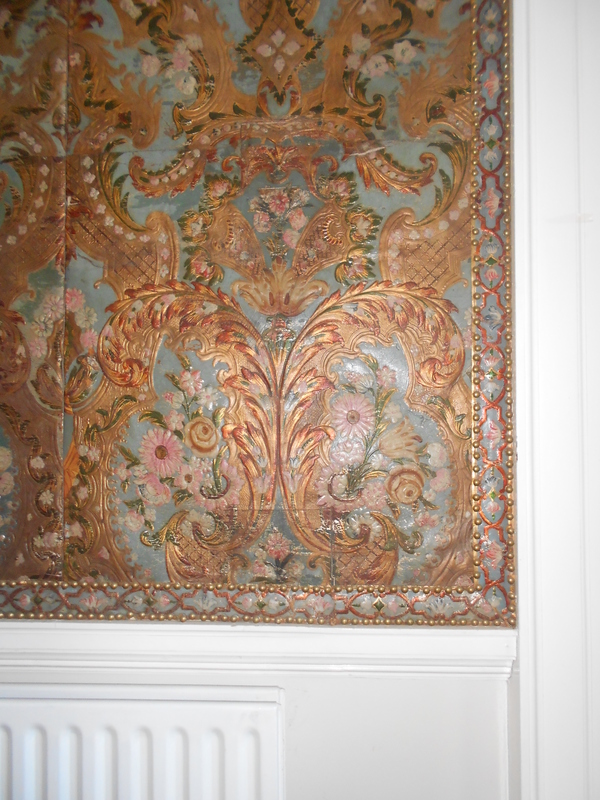 Embossed, gilt and painted leather hangings and border, circa 1725, in the saloon at Rathfarnham House, Dublin. 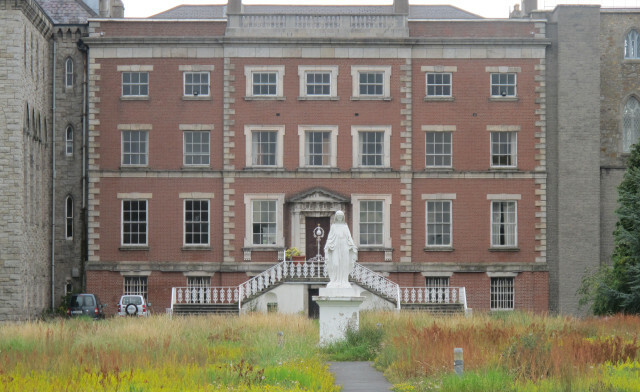 Sadly, the Loreto Order closed the school and sold Rathfarnham House in 1999. It was bought by developer Liam Carroll and remained empty until taken over by NAMA following Carroll’s bankruptcy in 2004. For a number of years it was occupied by live-in caretakers employed by a UK-based property minding company. Unfortunately the saloon with its leather hangings was selected for use as their combined kitchen and laundry, and the resulting fluctuating levels of temperature and humidity have inevitably had a harmful effect on the sensitive material. The Saloon in recent use as a caretakers’ kitchen and laundry. Damage to the leather caused by unfavourable environmental conditions. In 2014 the site and complex of buildings, which includes a chapel and substantial additions designed by A.W.N.Pugin and Patrick Byrne, was bought by the Department of Education and Rathfarnham House has thankfully found a new lease of life as an Irish-language school, Gaelcholáiste an Phiarsaigh. This inspired move has saved a remarkable and beautiful building in the nick of time – though at the time of writing the fate of the leather hangings is not known. 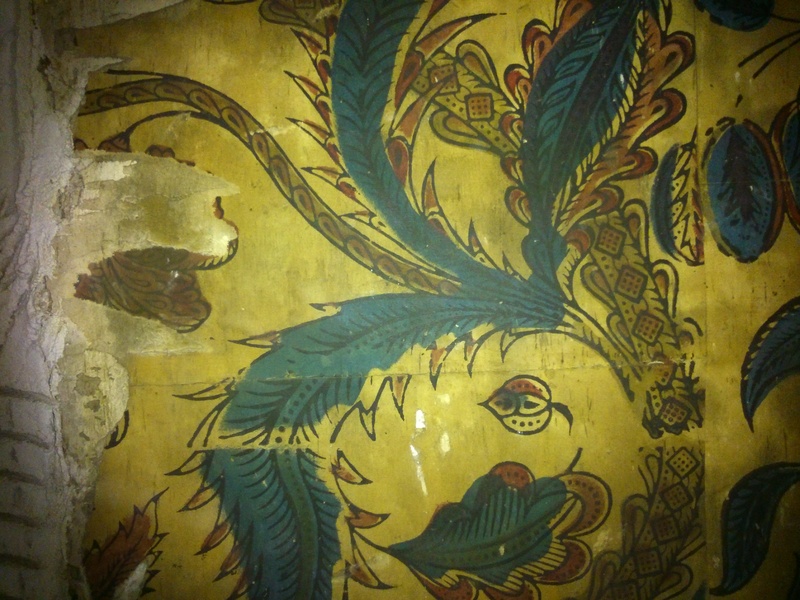 These fragments of wallpaper were recently uncovered when the chimneypiece was taken down in a first-floor room on the south side of Trinity College’s Parliament square, between the Examination Hall and the West Front. 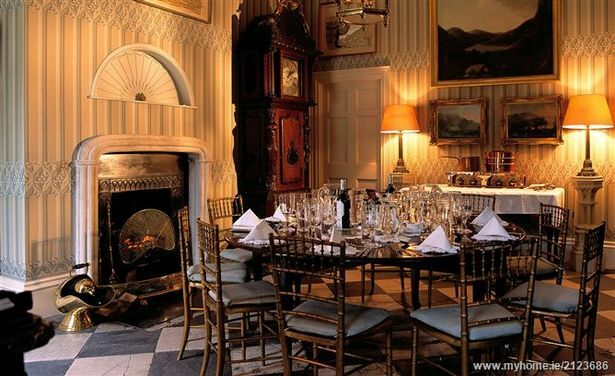 The building dates from the late 1750s, but the chimneypiece was a later, larger and more ornate addition, placed over the original simple fireplace opening, thus preserving what must have been part of the earliest decorative scheme. These ‘architect’ papers (as they were described at the time) were fashionable for a short period from around 1760, when paper-stainers such as John Gordon of Dame Street began to advertise patterns ‘consisting principally of Gothic or Grecian Architecture, in due perspective and proportioned agreeable to their respective orders’. 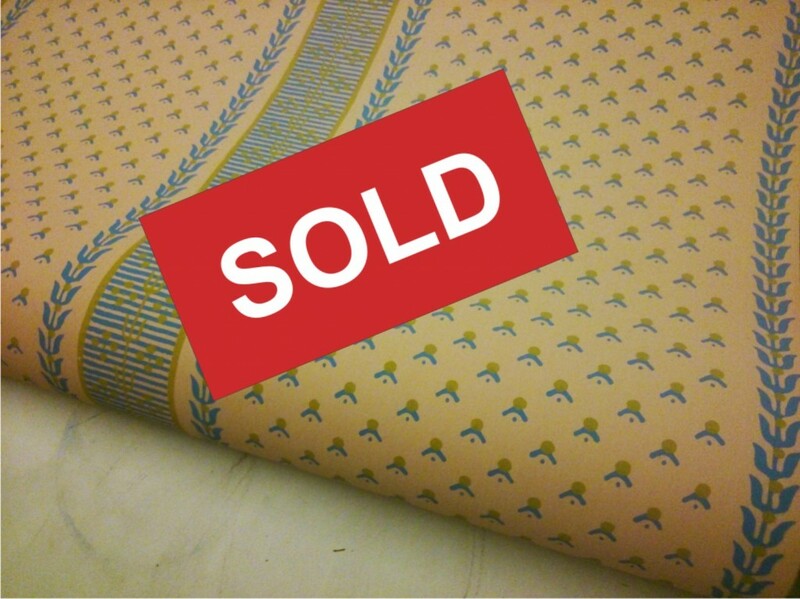 They were something quite new in a market dominated by wallpaper patterns based on textiles*, and reflected the mid-century taste for classical architecture and ruins, born of the Grand Tour and disseminated through engraved versions of the paintings of Paolo Pannini and other specialists in views (or ‘veduti’) of ancient Rome. 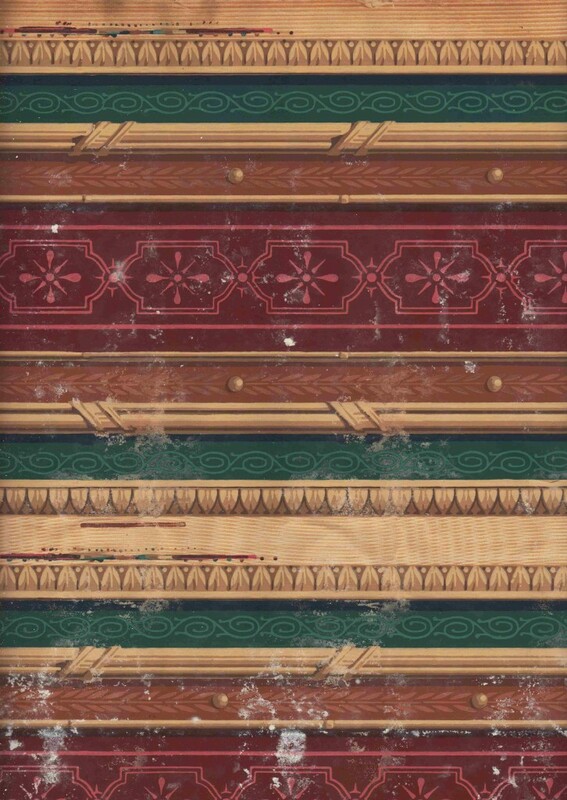 The ‘Grecian’ versions of these wallpapers include colonnades supporting round arches, sometimes opening onto views of buildings, or sometimes – like the Trinity paper – including floral elements, swags, baskets, etc. 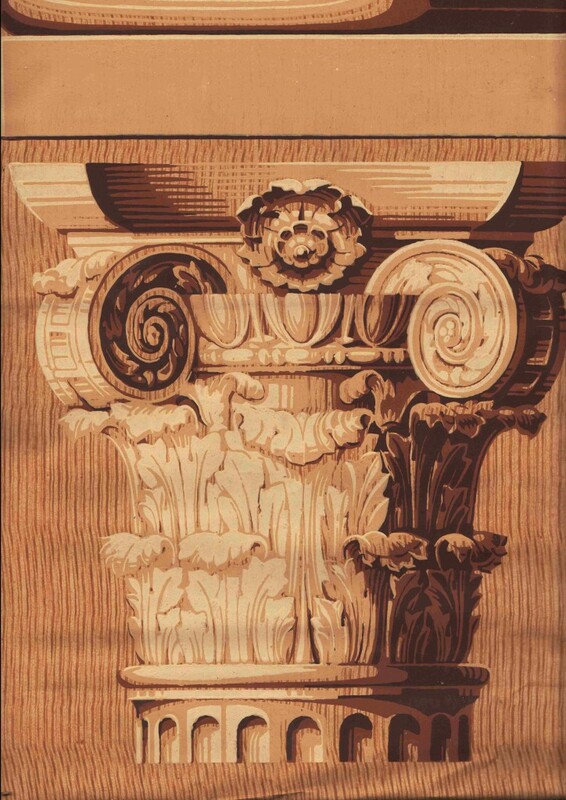 Using the technique of printing shadows and highlights (chiara-oscuro) to create an impression of forms standing out in relief, many of the surviving examples in Britain and North America are printed in sombre shades of umber-grey, black and white. More colourful examples occur, as for example the well-preserved Gothic ‘architect’ paper on a blue ground in Springhill, County Derry, or small fragments found some years ago in number 9 Henrietta Street, Dublin. 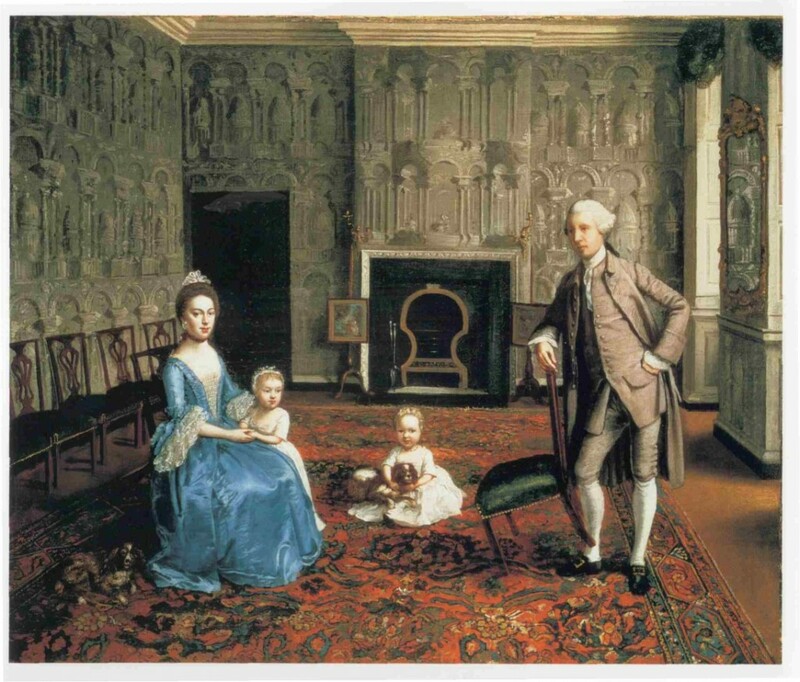 A most impressive depiction of an interior decorated with such a paper is the family group painted by Strickland Lowry, now in the National Gallery of Ireland, which gives some idea of how the room in Trinity might have looked when newly decorated – including the simple fireplace with its fiddle grate. 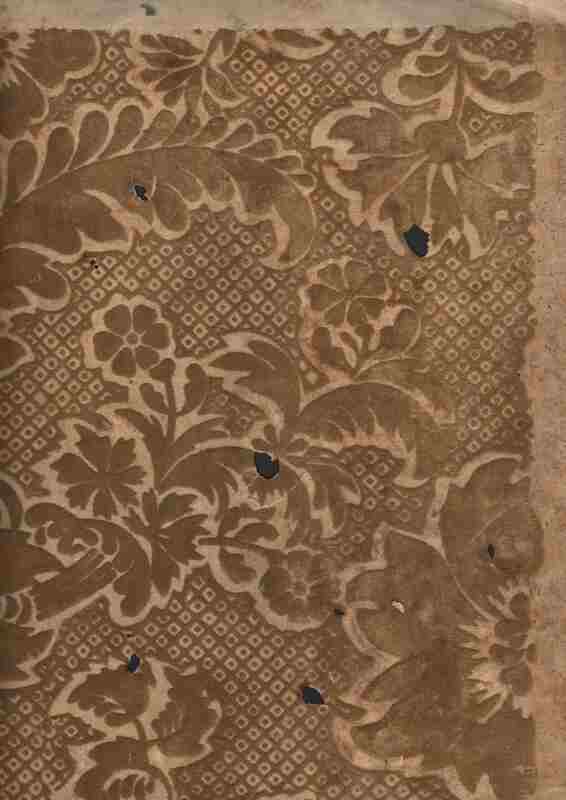 Tax stamps on the back of the Trinity wallpaper show that it was printed in England, not locally (the wallpaper tax was not introduced in Ireland until 1797), even though the Dublin wallpaper-making trade was well developed by 1760, and Dublin paper-stainers such as Gordon advertised their own versions of ‘architect’ papers. Which College professor, we may wonder, wished to impress his colleagues by decorating his rooms with this stylish paper, and would any of his present-day counterparts go to the same lengths? 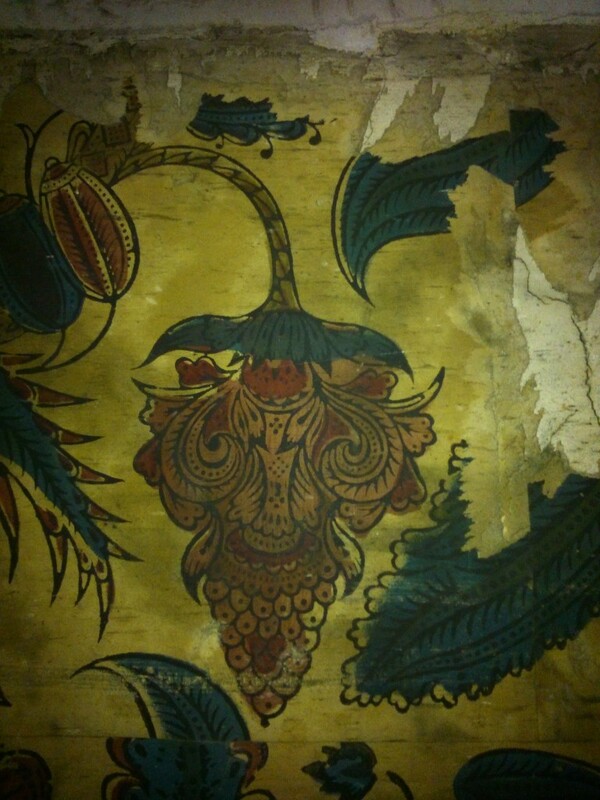 * See the earlier post ‘Flower Power in the Sixties’ for another recent discovery in Dublin of wallpaper dating from the 1760s, and a type of pattern which could not present a more extreme contrast to the paper found in Trinity College. RTE’s new drama ‘Rebellion’ has rightly received glowing reviews. The sense of period is impressive, with many of the familiar city locations miraculously stripped of their twenty-first century clutter – even to the extent of Nelson’s pillar reappearing outside the G.P.O. Costumes and interiors have been carefully assembled, although in some cases the latter were definitely not filmed in the buildings where the action was supposed to be taking place. 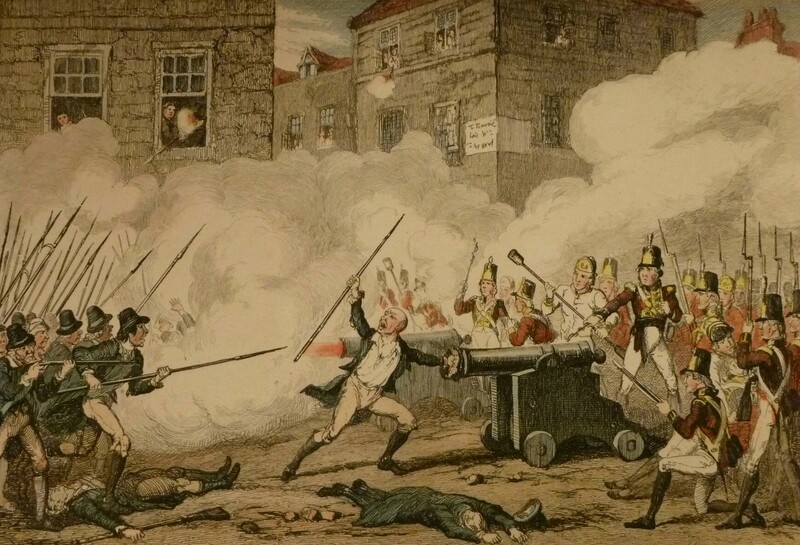 This was the case in the scene where British civil servant Charles Hammond (played by Tom Turner) and his secretary May (Sarah Greene) are having an extra-marital interlude in a bedroom of the Shelbourne Hotel, rudely interrupted as a Citizen Army soldier bursts into the room. 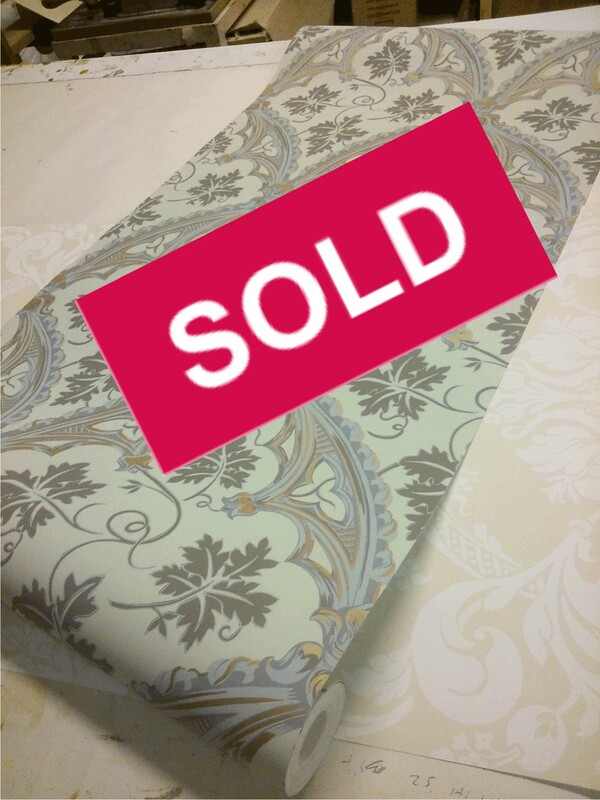 My own surprise was if anything greater than the on-screen couple’s when I saw that the room was papered in our ‘Malahide’ pattern – a Regency gothic design dating from the 1820’s. A bit of mental backtracking through our order book identified the location as Cabinteely House in south County Dublin, often used for film locations. 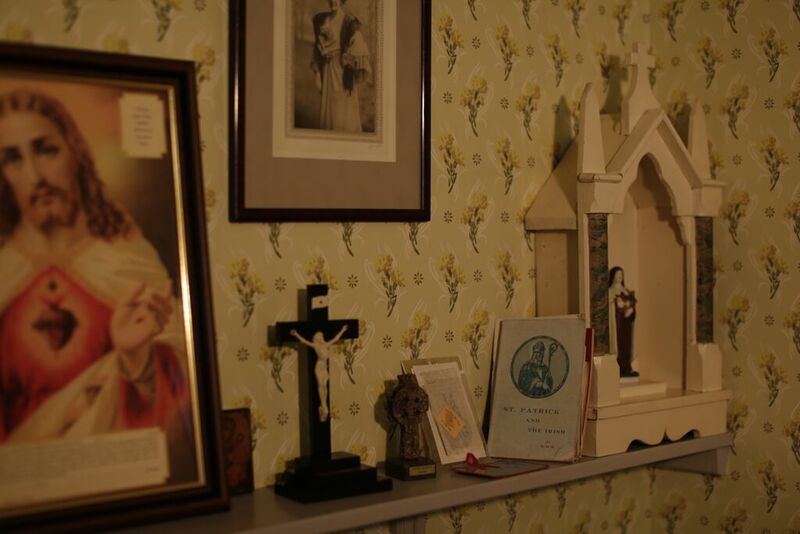 In fact, another room in Cabinteely (this one papered with our reproduction of a pattern from Newbridge House), also appeared in last night’s episode, representing the drawing room in trainee doctor Elizabeth Butler’s family home, which she leaves on the morning of her wedding to join the rebels in City Hall. 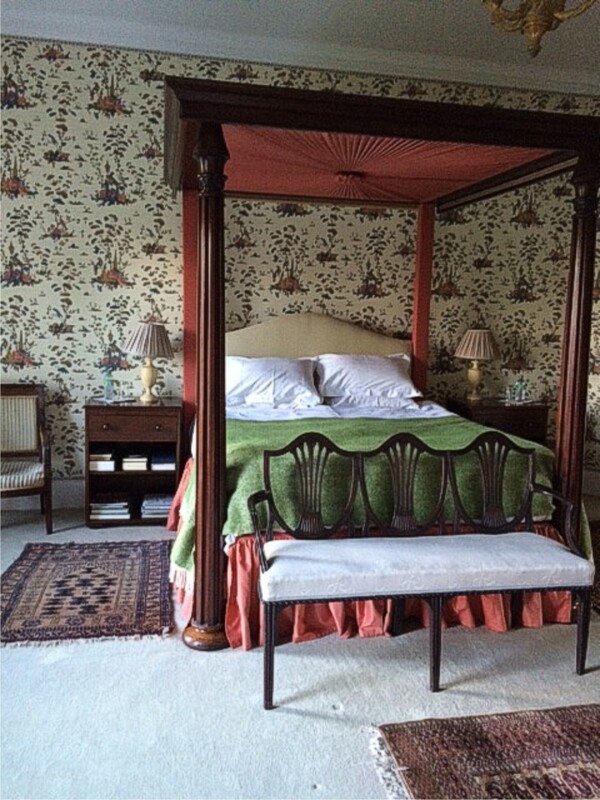 The location of the fictional Charles Hammond’s house – where he rather unwisely sends May to wait out the rebellion in the company of his wife – is Marlay House, where May’s bedroom is papered in our reproduction of a pattern from the 1790s found in the house in the course of conservation back in the 1990s. Two of these patterns – ‘Malahide’ and ‘Newbridge’ – were first produced in the 1820s by the Dublin wallpaper maker Patrick Boylan, the leading paper-stainer and decorator of his day. Their use in the 1916 drama is therefore a little anachronistic, although few would notice this. 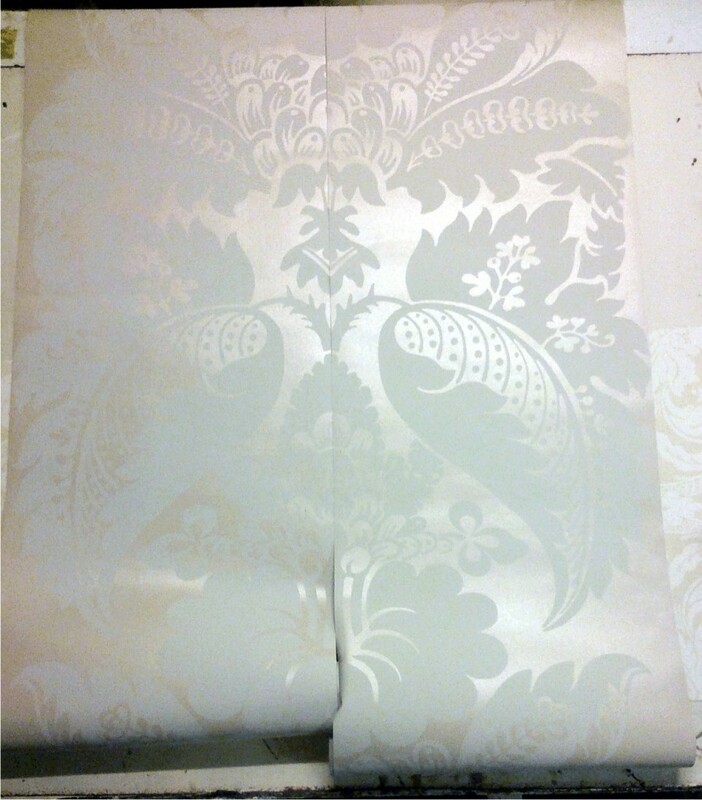 This is not the first time our wallpapers have been hung in the cause of Irish freedom. 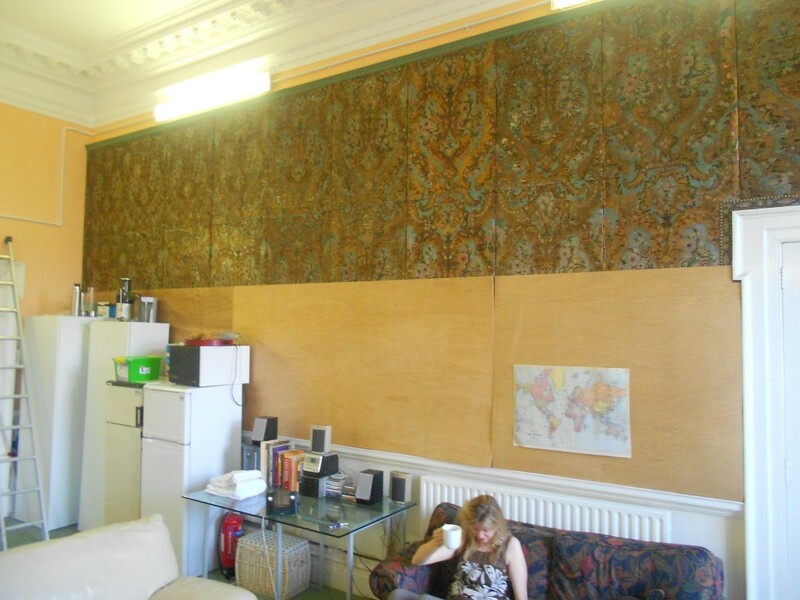 In 1995 we made wallpaper for the set of Neil Jordan’s ‘Michael Collins’, in which the role of Liam Tobin was played by Brendan Gleeson – whose son Brian appears in ‘Rebellion’ as Jimmy. ‘Malahide’ also made an appearance recently in ‘The Invisible Woman’, directed by and starring Ralph Fiennes, where it decorated the walls of Charles Dickens’ study. Thanks to those who have donated to a range of charities (including Cystic Fibrosis Ireland, Trocaire, the DSPCA and Guide Dogs for the Blind) we now have shelf space and room to breathe again in the studio. 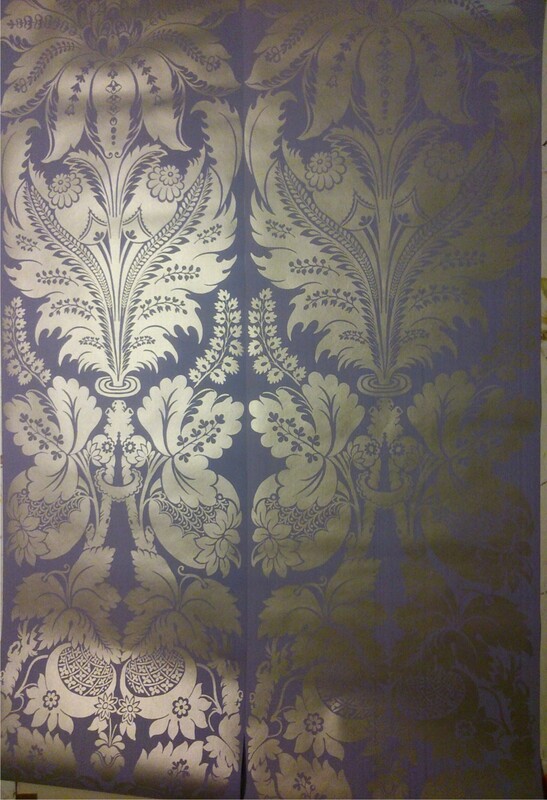 But there are still one or two lots waiting for the right wall – so go on: why not buy the purple and silver ‘Gandon’ damask and bring out your inner oligarch? Details are three posts down from here. 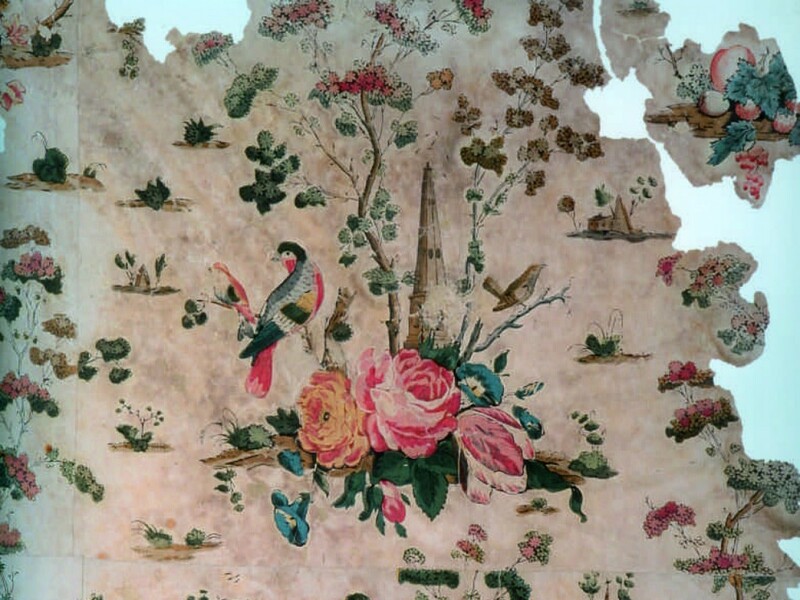 The 1760s, that is – a recently discovered wallpaper in Dublin’s Merrion Square leads to an investigation of chintz patterns in eighteenth-century furnishing and dress. 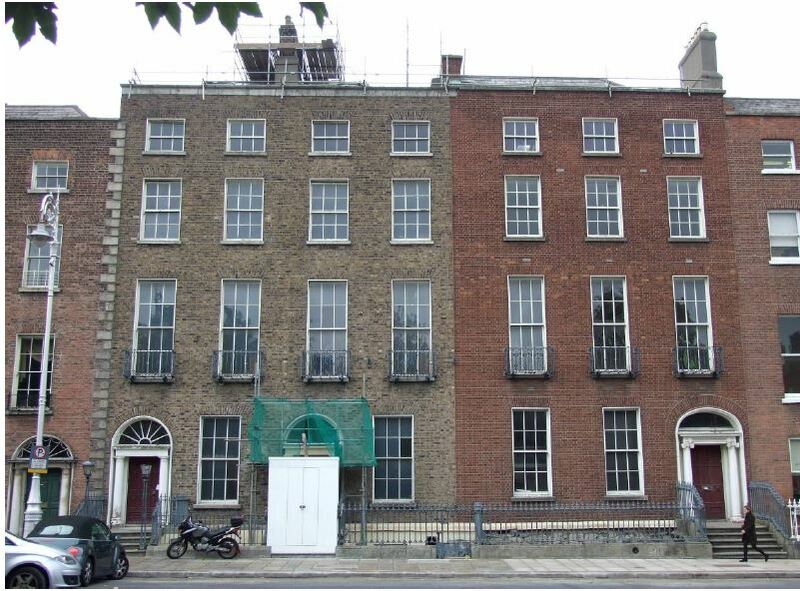 93 Merrion Square is a three-bay house built around 1760, situated between the National Gallery and Lincoln Place, and part of a terrace which pre-dates the rest of the square. Its earliest occupants, whoever they were, might have looked out from the windows of the front room of the first floor to watch the surveyors and builders who were transforming the open country of the Fitzwilliam estate into Dublin’s most ambitious urban development. 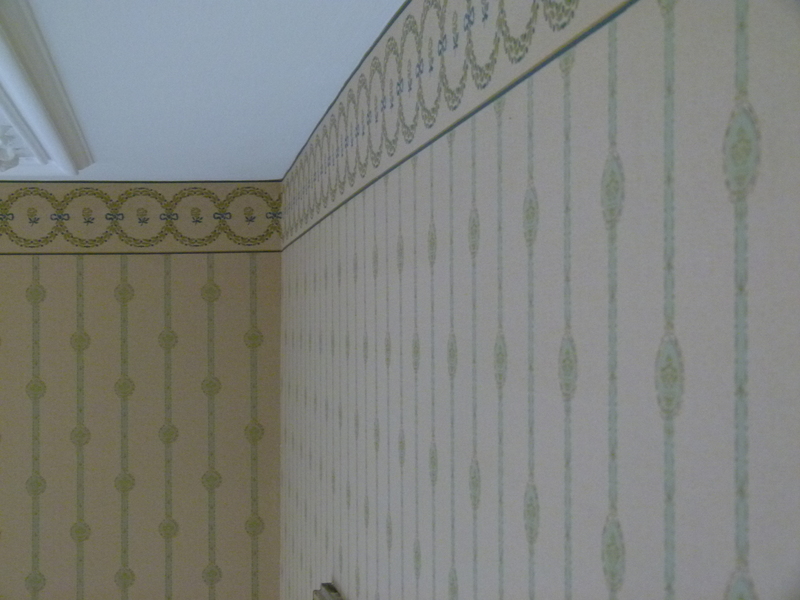 When they turned from the windows they might have retreated into the rear room, which was papered with this wallpaper. This has survived, somewhat miraculously, in a building which has undergone many alterations over the course of its history. Not very long after the house was built, the chimney breast in this rear first-floor room was widened by around two feet on each side, using lath and plaster, and it is in the void created by this extension that the paper has been preserved. Almost every other detail of the room has been substantially changed in the intervening period. The pattern is surprisingly – perhaps even shockingly – bold and colourful. It combines intricacy of design with a certain crudeness of execution, and the flowing lines possess great vitality – as we see by zooming in and rotating this detail of a flower head, which seems to have an almost human quality. 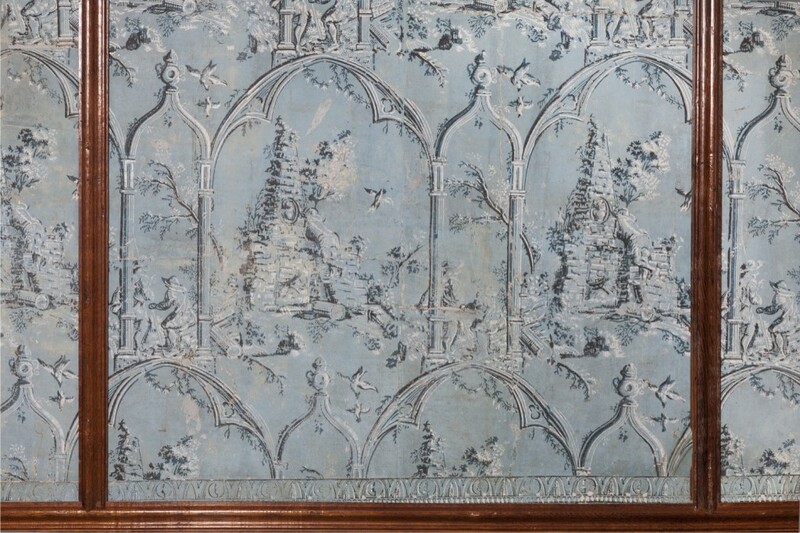 This remarkable wallpaper is formed from hand-made sheets, joined together to form lengths – the joins are visible in the photo. 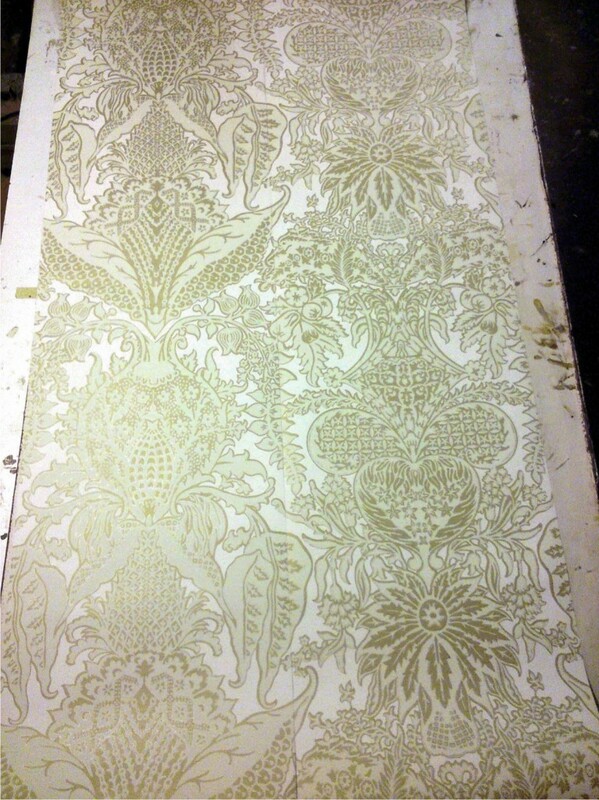 The black outlines of the pattern are printed with a wood block, and the colours are brushed on by hand using stencils. Apart from the boldness of the design, the noticeable feature is the lack of precision in both the printing and the installation of the paper. It is obvious where the pattern meets the edge of the printing block, and that the printer could have aligned the next print more carefully. The stencils are crudely shaped, loosely following the outlines of the pattern, and have sometimes been positioned quite carelessly before the colours were applied. The matching of the pattern across the two adjacent lengths of paper shown in the image is almost slapdash. One hopes the customer was happy, and that the overall effect was felt to outweigh these discrepancies, which seem to indicate a craft in the early stages of its development. 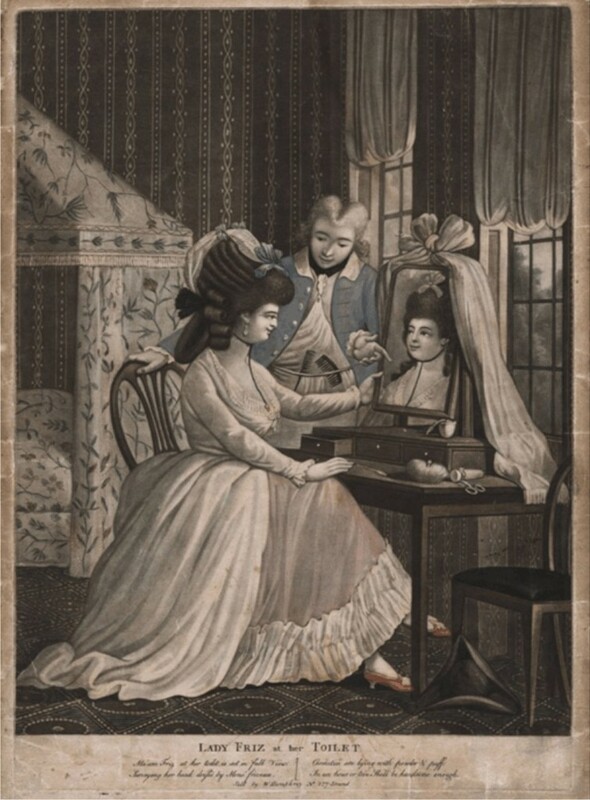 By 1760 the wallpaper trade was well established in Dublin, and consumers could choose to buy from among half a dozen paper-stainers active in the city. Their advertisements list some of the styles available at the time: Thomas Russell of Bride Street, for example, sold ‘Flock, Chintz, Stucco, Mock Indian, Architect, Gothic and Landskip’ patterns. 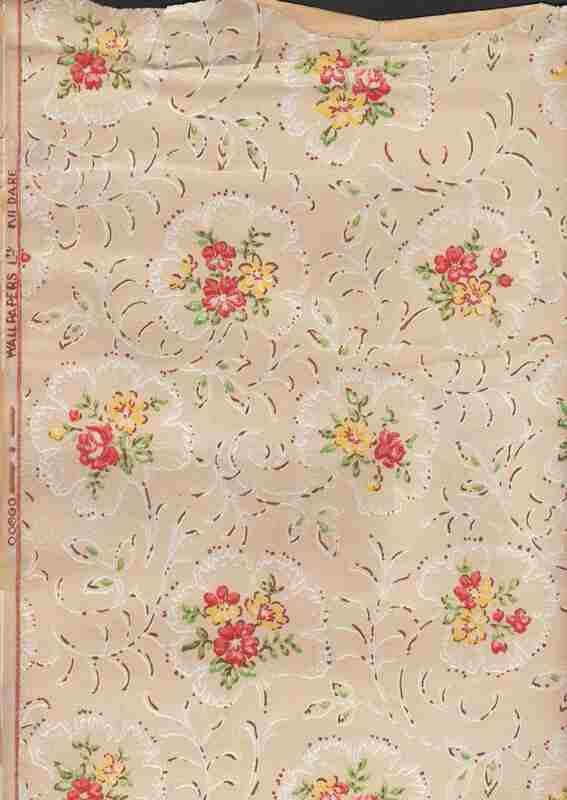 Of these, chintz patterns seem to have been particularly popular, judging by the number of examples which have been found in Irish houses of all sizes . The paper in Merrion Square is an early and particularly striking example of the type. But what exactly do we mean by chintz? The word first appeared in the early 17th century in its singular form ‘chint’, derived from a Hindi word which means spattered or stained. 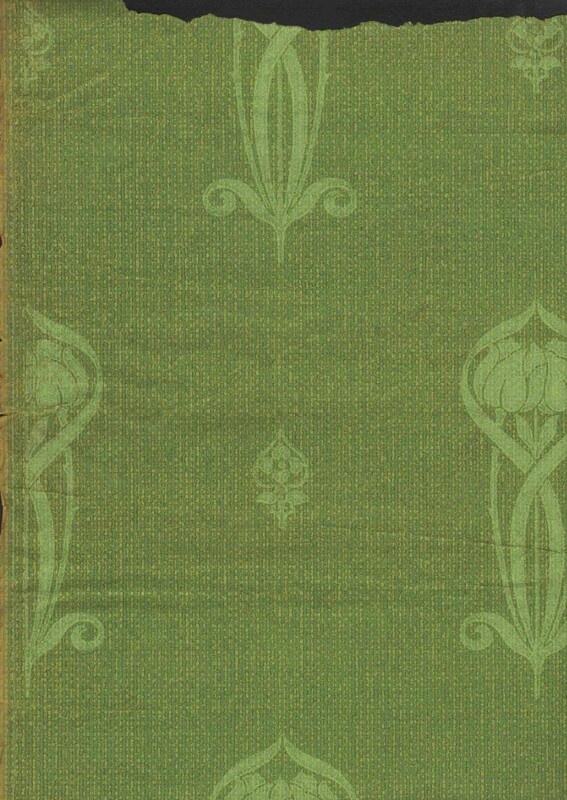 ‘Chint’s’ were colourful, painted cotton cloths produced in India for a variety of purposes.This example is typical, with exotic, imaginary flowers and writhing leaves blossoming from a sinuous stem. 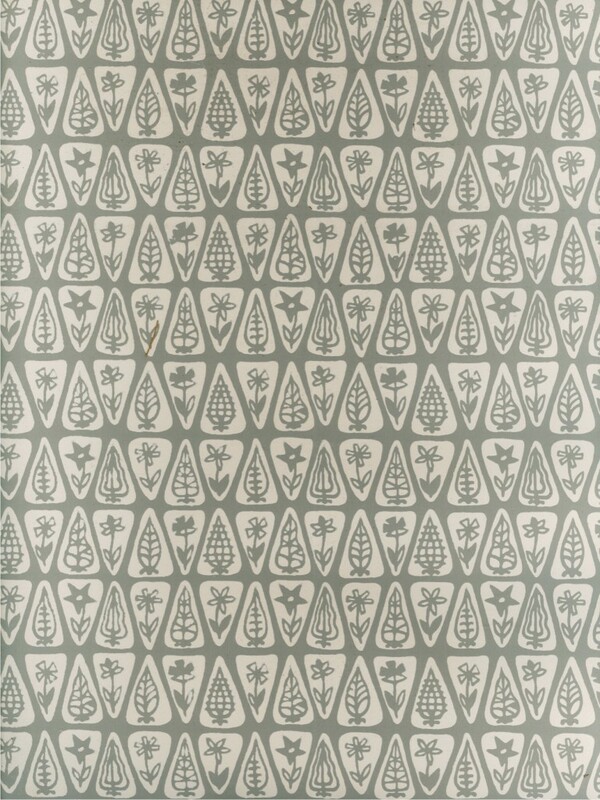 The diamond-shaped pattern which embellishes the stem is echoed in the wallpaper example from Merrion Square. 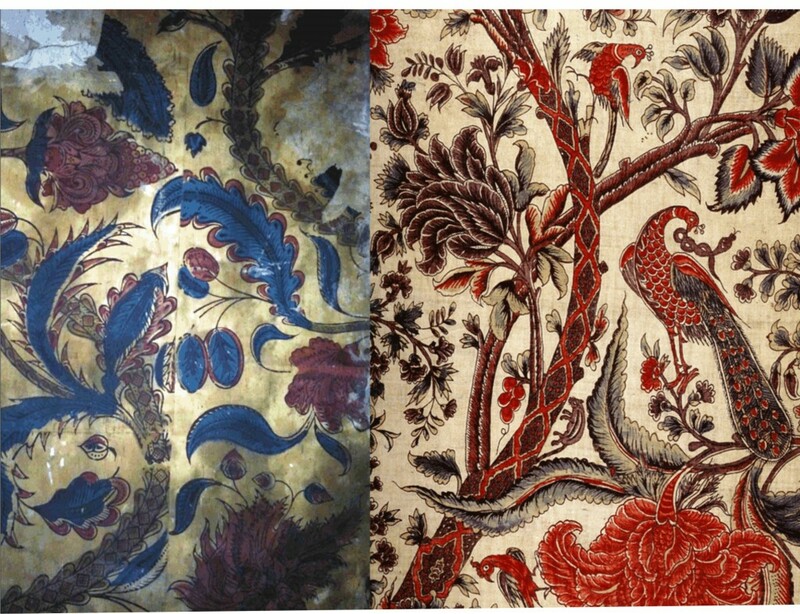 From the time they appeared on European markets in the late seventeenth century chintzes became highly sought after, both as dress fabrics and for home furnishing. 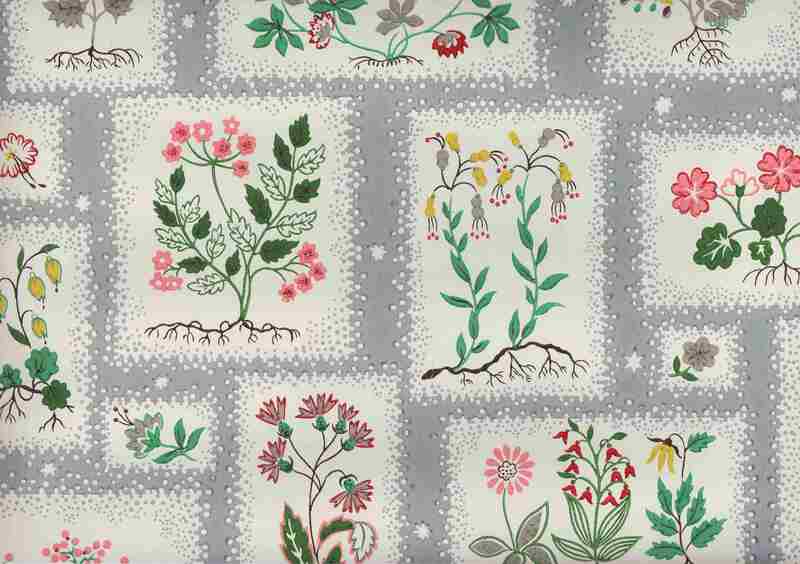 So great was the material’s popularity among English consumers that it was soon perceived as a threat by wool and silk merchants and manufacturers, who in 1721 persuaded the government to bring in a prohibition on the sale or wearing of chintz. Despite this ban, chintzes continued to find their way into English and Irish homes as contraband. In Ireland, the restrictions on chintz were less rigidly enforced – but the material was still targeted by supporters of native manufacture such Samuel Madden or Jonathon Swift, who in one of his pamphlets called on parliament to outlaw the wearing of Indian silks or calicos. 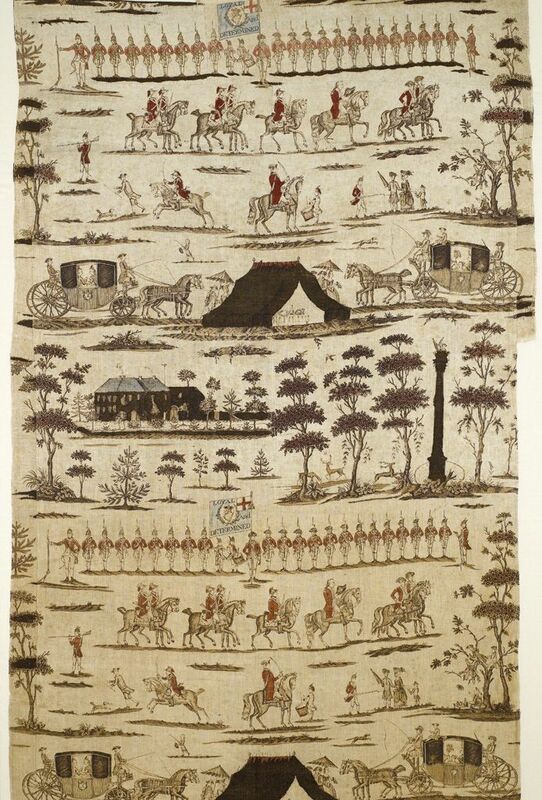 In the propaganda campaigns against calico and chintz, the very qualities which made cotton so popular – its comfort and lightness principally – were seized on by the woollen and silk lobbyists and used to suggest that the morals of those who wore chintz or calico were in some way, like the fabric itself, loose, light-weight and flimsy, and therefore suspect. Daniel Defoe described the woman who wore chintz as ‘an enemy to her country’. Taken together with its nature as contraband, this must have given the acquisition and use of cotton chintz a certain frisson of transgression. 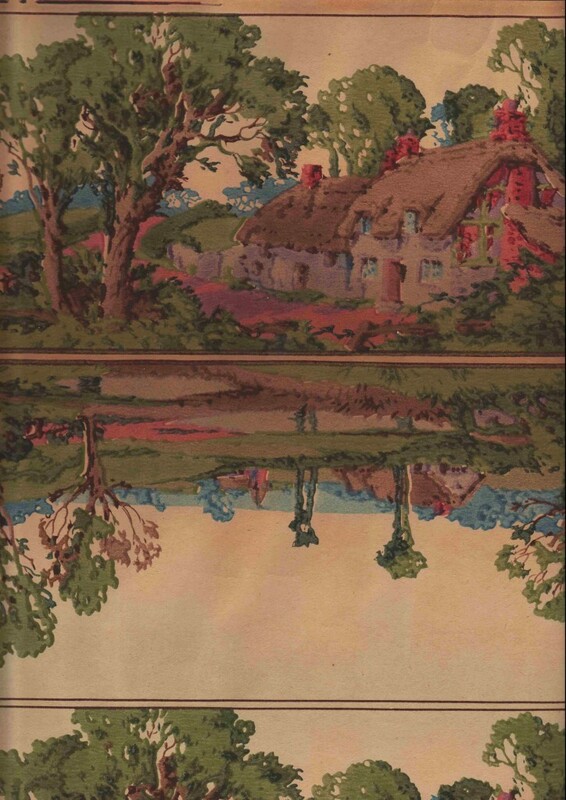 Chintz fabrics were widely used for dress and furnishing in Ireland, although their use is not recorded in any contemporary portrait painting that I am aware of. The reason of course is that cotton chintz fabric was not formal wear – it was regarded as ‘undress’, and those sitting for portraits almost invariably chose to have themselves depicted in formal finery. Across Europe, wearing chintz out of doors was a risky thing to do. At the very least it might attract sniffy comments from your more conventionally-dressed peers, at worst the wearer might find herself attacked, either by supporters of the woollen or silk trades or even by revenue officials, who were authorised to remove imported cottons from the wearer’s back. Looking at chintz as a furnishing material, it is apparent that the same distinction between formal wear and undress applied to furnishing textiles as well as to garments. 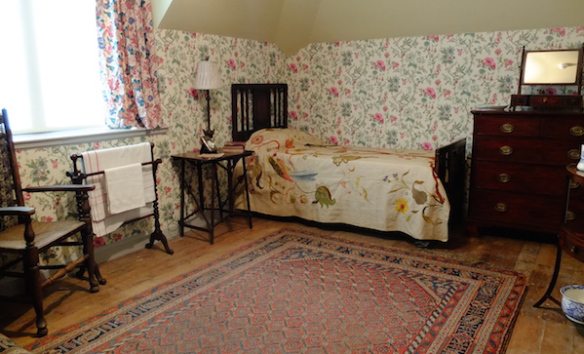 The use of chintz in Irish domestic interiors is amply documented – recent research by Patricia MacCarthy and others shows that in Ireland, as elsewhere, there was a code to adhere to in furnishing fabrics, as there was with dress. 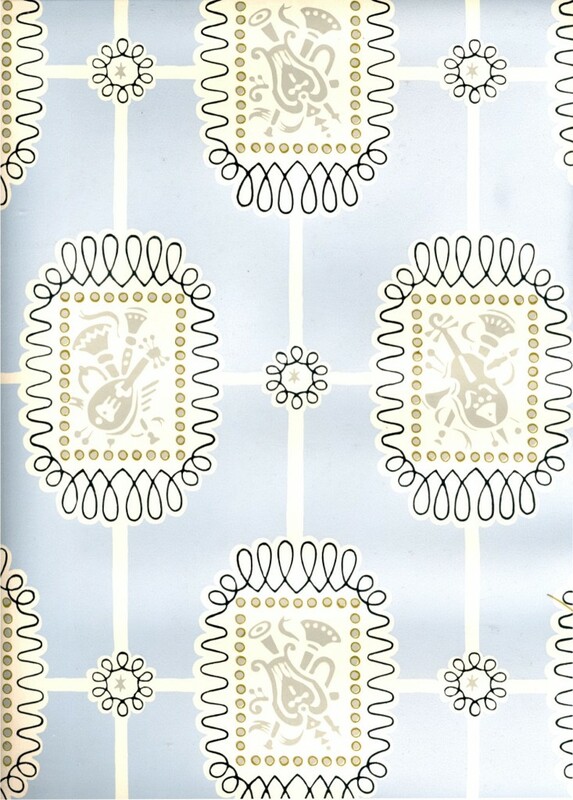 Chintz was acceptable in private or semi-private rooms, but not in formal rooms such as the drawing room or dining room (although in the following century printed chintzes would find their way into the drawing room). The window and bed curtains of bedrooms were usually made from the same material – the fabric varied from room to room and might be chintz, linen check, or brightly-coloured woollen fabrics such as camlet or morine. 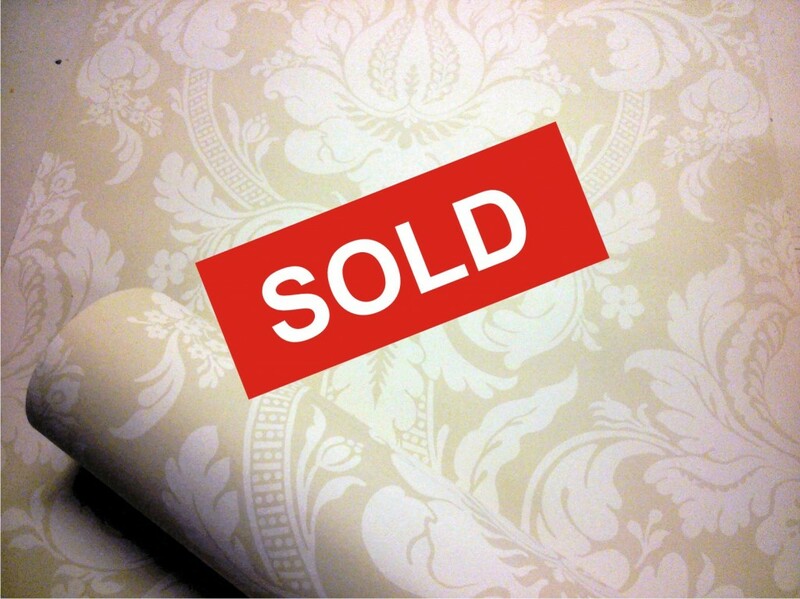 Dublin paper-stainers advertised their ability to match fabrics with wallpaper, and it is likely that in bedrooms described as having cotton chintz hangings the walls were papered with chintz-patterned papers. As with chintz garments, contemporary pictorial depictions of chintz furnishings are entirely lacking in Ireland and extremely rare across Europe – – this engraving shows a bed upholstered completely in a chintz fabric, but –annoyingly – without matching window curtains and wallpaper. 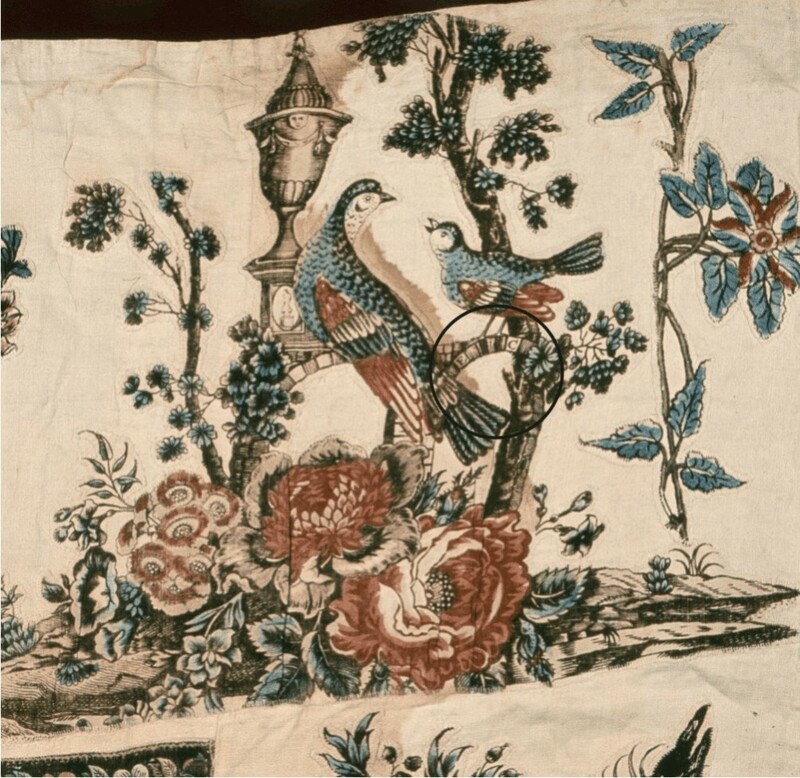 By the 1750s European textile printers had started to master some of the techniques of printing fast colours on cotton and linen, and were producing locally made imitations of chintz. In Dublin, several printing factories competed for this trade, and the term ‘Irish chintz’ began to appear on upholsterers’ invoices. 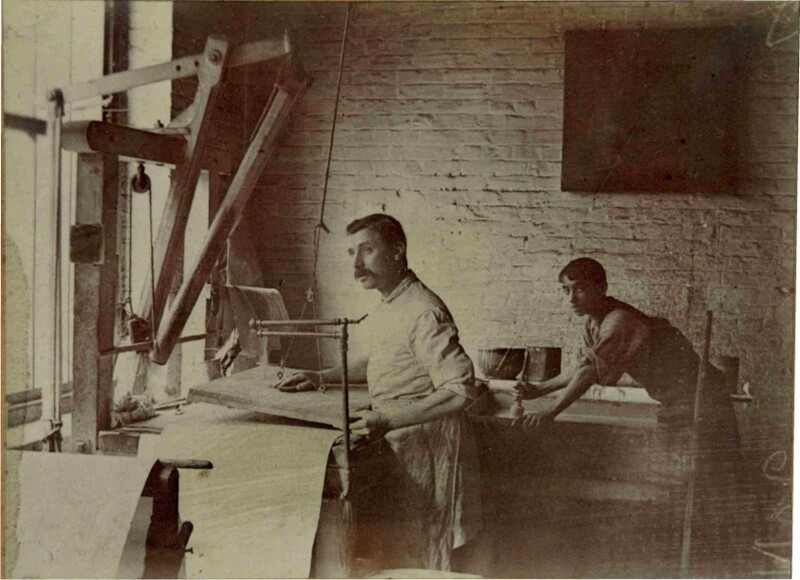 The factory of Thomas and Margaret Ashworth in Donnybrook produced both textiles and wallpapers – perhaps the Merrion Square paper is an example of their work? We don’t know. 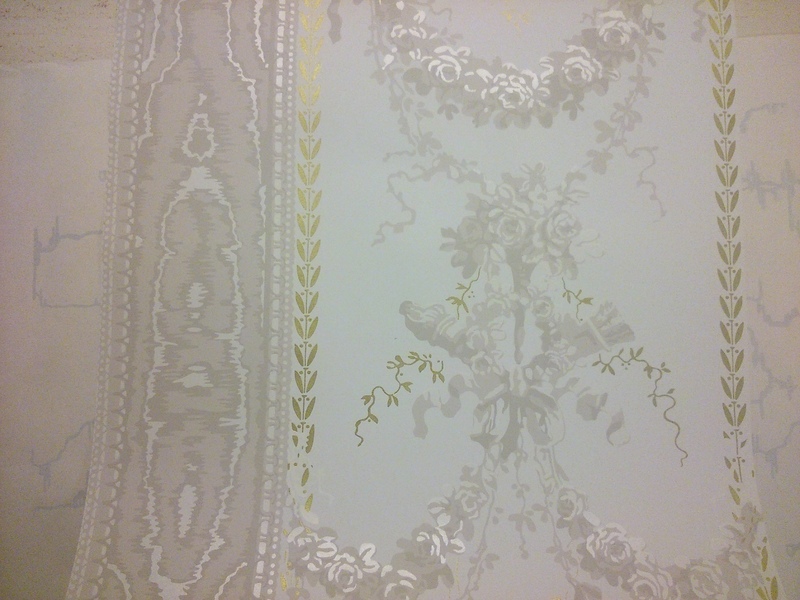 The discovery of the Merrion Square wallpaper shows that chintzes were not just confined to bedrooms, and that these vibrantly exotic, swirling patterns also had a place on the piano nobile – the first-floor suite of rooms in a terraced townhouse which formed the principal stage for hospitality and the display of wealth and taste. What function, then, did the rear room in 94 Merrion Square serve? 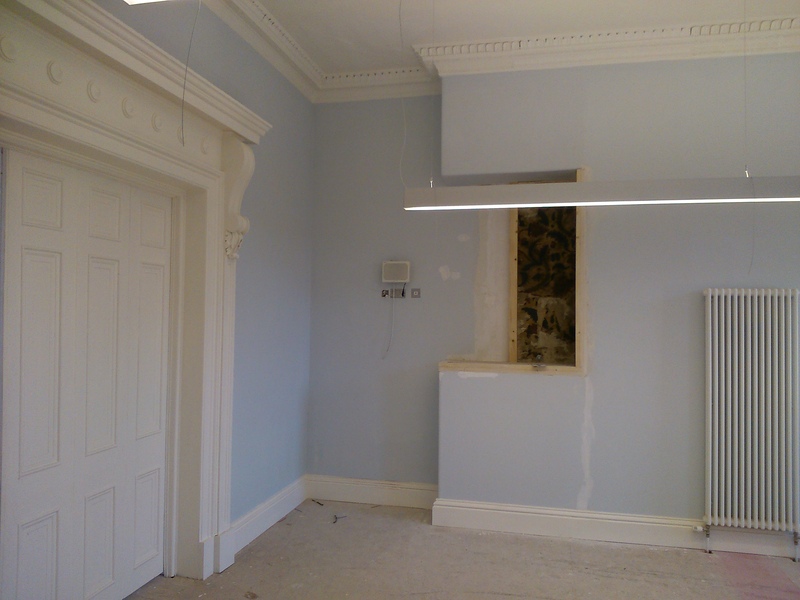 It is likely to have been described at the time as a dressing room – a possibility supported by contemporary references to dressing rooms occupying this part of a terraced house. 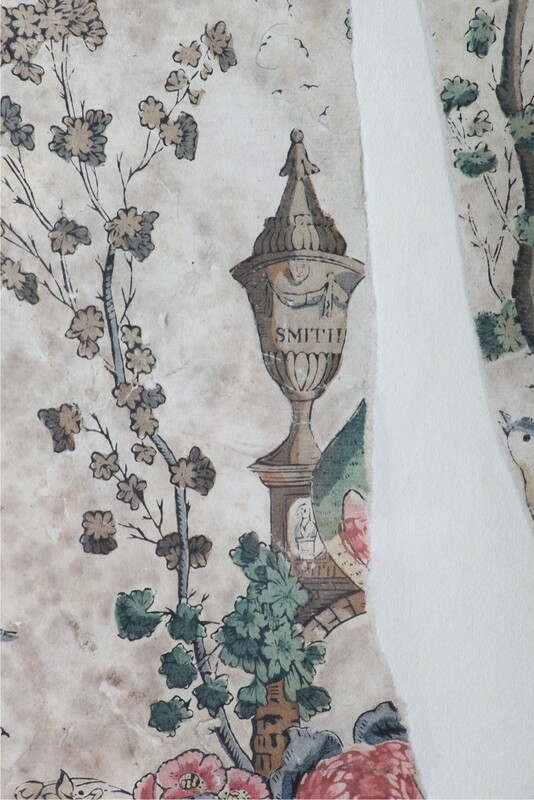 In an inventory of 1762, for example, the rear room of the first floor suite of Lord and Lady Doneraile’s Kildare Street house was named as ‘My Lady’s dressing room’, and was described as being decorated with chintz hangings . Lady Doneraile’s dressing room opened into a smaller bedchamber, and also to the drawing room, the main front room on the piano nobile (first floor). 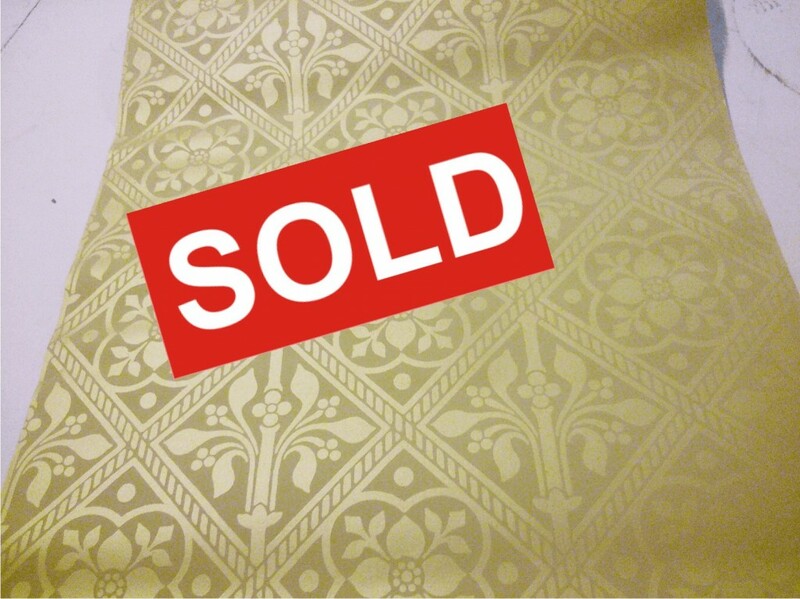 This had window curtains and seat furniture of crimson silk damask, with the walls perhaps papered in matching flock. When the connecting doors were opened, the contrast between the formal grandeur of the drawing room and the vibrantly exotic colouring of the dressing room must have been dramatic. 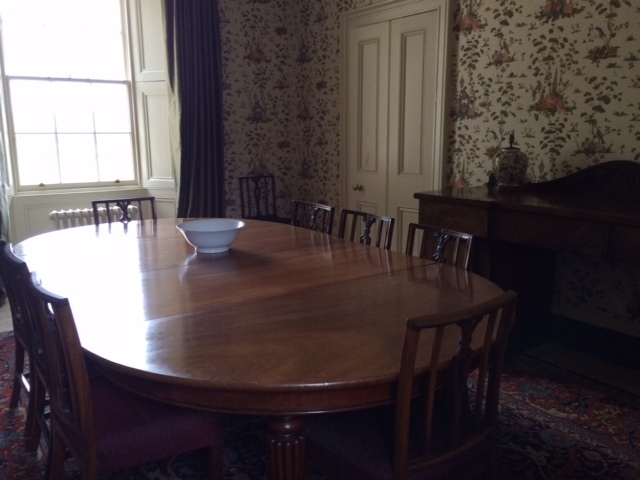 Besides the chintz hangings, the inventory of Lady Doneraile’s dressing room lists the turkey carpet, a japanned looking glass, an ‘India cabinet’ on a frame, a writing desk, glazed bookcases and a dressing table, covered with scarlet cloth. These objects evoke a range of activities from grooming and dressing to reading and writing. As the name suggests, the dressing room would be used to store clothes and as a place to change clothes, but it’s wider functions included those of a study, a work-room or as a less formal area for entertaining than that offered by the drawing room. The dressing room was one of the principal sites for displaying fashionable goods – and in particular oriental goods and their western imitations. Inventories tell us that the items to be found there might include dressing boxes, screens, tea boards and tea tables, japanned goods of all kinds and ‘India’ pictures or prints. Items of this kind were, by the mid century, increasingly being supplied by specialist dealers in East India goods, such as Robert and Mary Bijar at the India Warehouse on Abbey Street, (might their name indicate Asian origin?). At the Bijars’ Indian Warehouse, consumers could buy a wide range of oriental silk and cotton textiles and furniture, as well as jewellery, fans, coffee and ‘India’ paper (i.e. 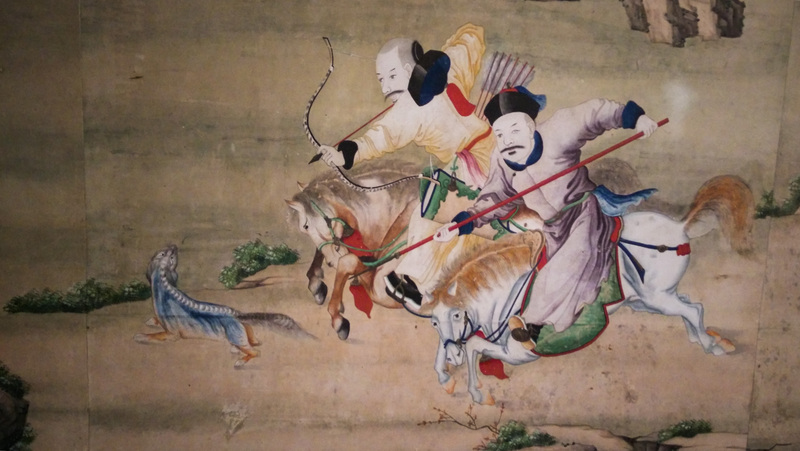 Chinese wallpaper). 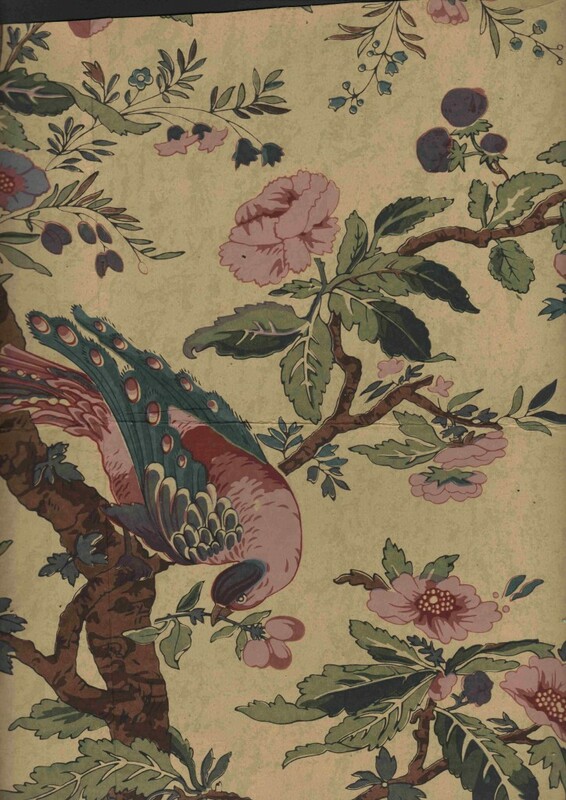 The discovery of the chintz paper in Merrion Square shows how the patterns which enriched the private spaces of the Georgians were – although largely unrecorded by painters – a lot richer in colour and pattern than we might suppose. 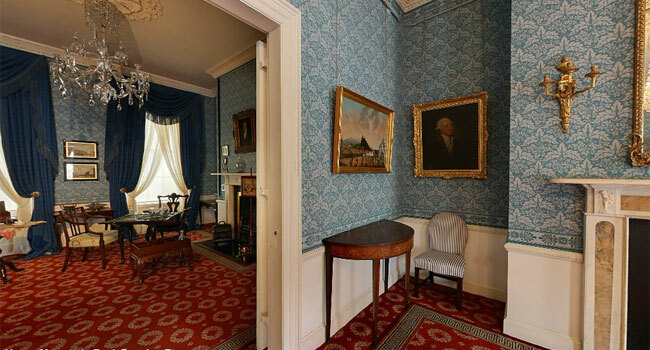 It opens a door to the material culture of the dressing room, and shows how local artisans responded to the influx of East India goods to add their own wares to the extraordinary variety of goods that were imported into Dublin. 40 rolls approx.., each 10m x 52 cm: enough for a large drawing room or several small rooms! Lying only a few hundred yards offshore in the quiet waters of Glengarriff harbour, Garnish island – or Ilnacullin as it is also known – can hardly be described as a remote island. Those who make the journey soon realise that it is a place apart, however – as did George Bernard Shaw, who came to the island several times. As he was leaving at the end of his final visit in 1923 his hostess, Violet Bryce bade him farewell with the words ‘Goodbye, Shaw – I hope we meet in heaven’. ‘Madam, are we not here already?, he replied before stepping into the boat. 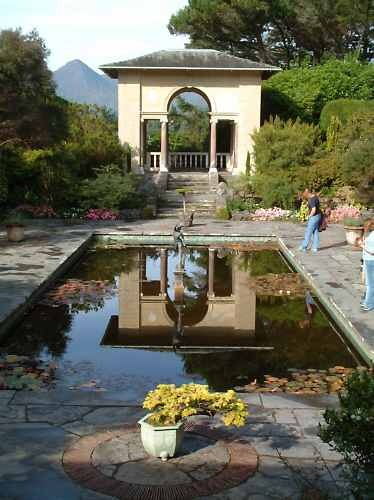 The island’s Italianate gardens, laid out by the English designer Harold Peto for the M.P. Annan Bryce and his wife Violet in the early years of the twentieth century, draw thousands of visitors a year, and are managed by the Office of Public Works. This year, the O.P.W. 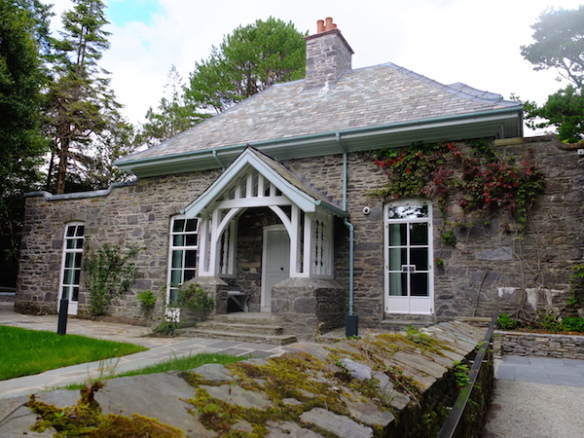 completed a major refurbishment and restoration of Bryce Cottage, the house where two generations of the family lived during their visits to the island. The cottage was originally intended as the gardener’s house, but Peto’s original designs for a huge, Lutyens-esque mansion built around the Martello tower on the island’s highest point never materialised, after the family lost most of their wealth in the Russian revolution, and guests like Shaw or Agatha Christie had to make to do with bedrooms of quite modest dimensions. 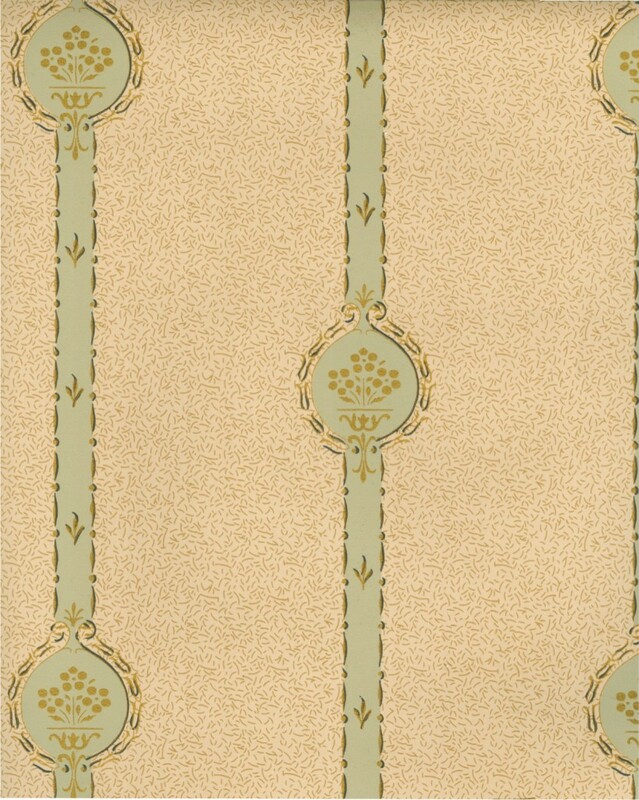 Both generations of Bryces were evidently lovers of wallpaper, and enough remained on the walls or at the back of cupboards to enable many of the rooms to be papered with copies of the patterns which had been used in the house. 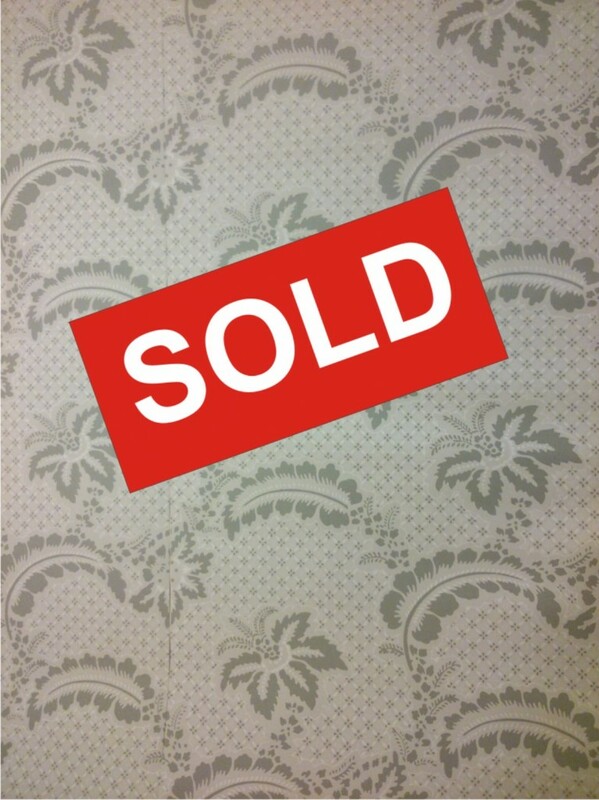 These are mostly patterns of the mid-twentieth century, and cover quite a range of styles – from the intricately drawn toile-style paper in the drawing room, to perkily avant-garde geometrics, right down to bog standard cottage florals made in Ireland by Kildare Wallpapers. 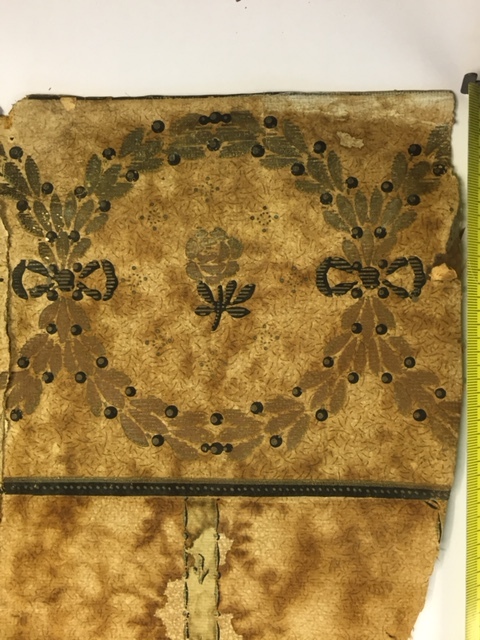 Papers from the early twentieth century were less in evidence, apart from small fragments of a pattern combining symmetrically flattened floral motifs set in strapwork, found in the entrance hall and upper corridor, and which might have been admired by G.B.S. The problem of sourcing suitable patterns for the earlier period was solved thanks to the resources of the Irish Heritage Trust’s recently established archive of historic wallpapers, stored in Fota House. Two very attractive patterns from the Fota archive were copied and used in Violet Bryce’s bedroom and another guest bedroom. 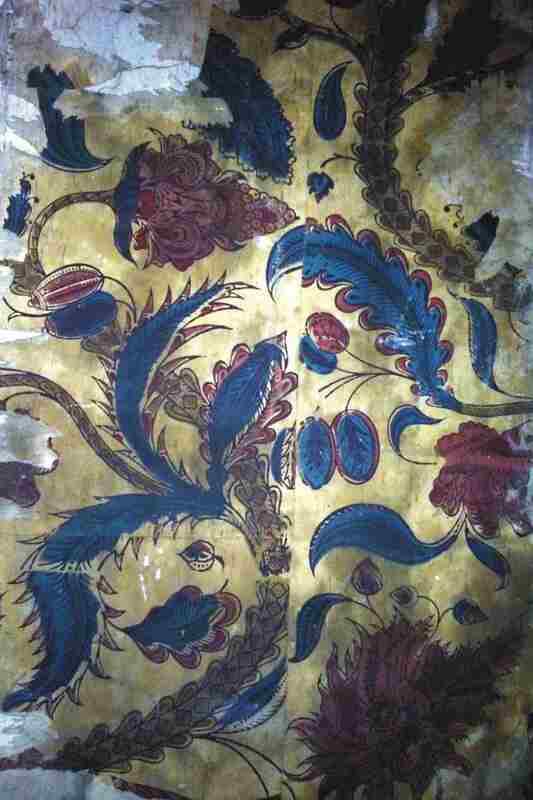 Also from the archive, a complete pattern – similar in style to the fragments found in the entrance hall – was copied and re-coloured to match the fragments. Altogether, we made twelve ‘new’ old papers for Bryce Cottage, most of them screen-printed in our studio in Leitrim, but some – for reasons of economy and speed – digitally printed. 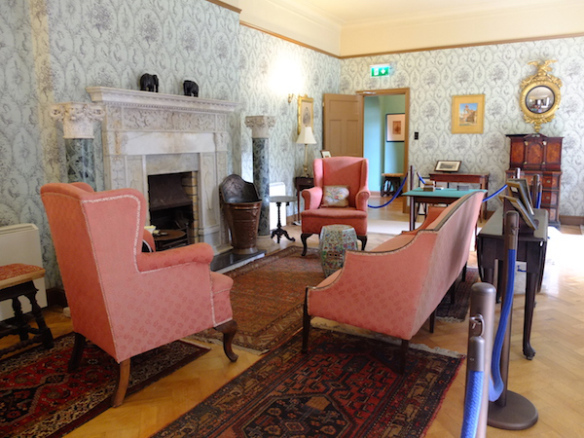 These now form a fitting backdrop to the furniture, paintings and memorabilia of the Bryce family and their two remarkable servants, the Scottish-born head gardener Murdo Mackenzie and the housekeeper Maggie O’Sullivan (1908-99), who in her lifetime on the island ‘cooked tea for all the Irish presidents except one’.